Michel Platini is next to Thierry Henry the greatest goal scorer in the history of Les Bleus, France's national football team, with 41 goals (and with a higher scoring average than Henry) and regarded as one of the most lauded and prominent figures in international football of all time. The footbal icon Michel Platini has served as a successful offensive midfielder, captain as well as manager of the French team. After his career he did become president of the UEFA which ended in scandalous forms and cracked Platini's good reputation. Platini (to the right) and Diego Maradona in 1987. Born in a family of Italian immigrants on June 21st, 1955 in Joeuf, north-eastern France, the distinctively talented and ambitious Michel had aspired to become a professional soccer player from an early age. In 1972, while still in his teens, he joined the reserve team of the French football club AS Nancy where his father Aldo Platini served as director and the following year he made his first division debut with Nancy club, in the Lorraine region. He scored a total of 17 goals for AS Nancy and led his team to the 1978 French Cup Championship. A year later, he joined Saint-Etienne, the leading French club at that time and diligently played to propel his new team to the Ligue 1 title in 1981. After three years with Saint-Etienne, Michel Platini transferred to the reigning Italian soccer club Juventus in 1982, emerging as an international soccer superstar and stoically captaining his team to the 1983 European Cup final, the 1983 Intercontinental Cup and the 1985 European Cup championships. 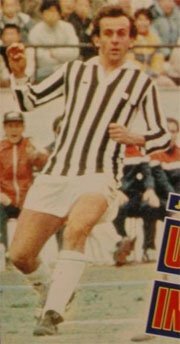 During his 5-year tenure with Juventus (1982-1985), he scored a record 68 goals in 147 league games for the club, out of a total of 224 league goals and became the top scorer of the Serie A on three different occasions. In 1984, Platini reached the culminating point in his outstanding playmaker career, as Juventus captured the 1984 UEFA Super Cup, Cup Winners’ Cup and the league championship. Widely recognized for his great mind, impeccable technique and precision, remarkable passing ability and ball control, as well as his tremendous creativity, awe-inspiring vision and leadership capability, the midfield maestro and captain of The Blues earned the nickname “Le Roi” (the King) and went on to dominate international soccer in the 1980s. Michel Platini made his debut with his home country's national football team, coached by the famous Michel Hidalgo back in 1976 and scored his first goal with a signature direct free kick. He brilliantly led the French team to a fourth-place finish at the 1982 FIFA World Cup thanks to a glorious free kick in a match against Holland on home soil as well as to a third-place finish at the 1986 World Cup in Mexico, after losing on a penalty shoot-out to the West Germany national team in a World Cup classic match. Platini struck his very first World Cup goal against Argentina, which won the championship. One of the greatest passers in soccer history, Platini wowed both his peers and audiences with his unrivaled capacity for taking both free kicks and penalty kicks. He proudly stated that his philosophy on football revolves around scoring goals. At Euro 1984, his outstanding goalscoring prowess propelled him to score a record of 9 goals in 5 matches, including 2 hat-tricks finessed into perfection, becoming the 1984 UEFA top scorer and giving the French national team its first-ever international trophy. Michel Platini retired three years later, aged 32, in full glory and with "no regrets", despite the fact that a FIFA World Cup trophy has never found a place in his impressive haul of silverware he proudly displays. Throughout his remarkable and prolific professional soccer player career spanning 15 years, Platini won three consecutive European Footballer of the Year awards (1983-1985) as well as two prestigious World Footballer of the Year awards in 1984 and 1985, among numerous other distinctions. Soon after leaving the pitch while he was still at the peak of his illustrious career, the FIFA 100 inductee took on the role of France’s national team coach back in 1988. Four years later, he resigned from this position after his team failed to go past the first round of the tournament in Sweden and then was elected co-president of the organizing committee for the 1998 World Cup, hosted by France. Michel Platini held several administrative positions in UEFA, FIFA and the French Football Federation before being elected UEFA president in 2007. But in 2015 the Sepp Blatter corruption scandal would also involve Platini and Fifa wanted to life ban the UEFA president.